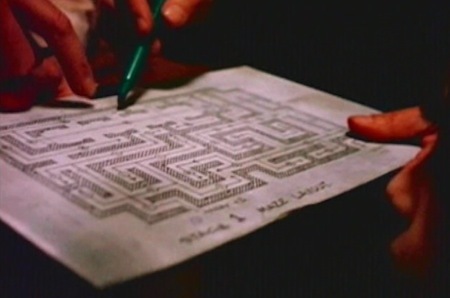 MGM Borehamwood: The non-snowy maze featuring scenes with Wendy and Danny in daylight was built on the former MGM Borehamwood backlot, as there was no room on the backlot at EMI Elstree Studios after the Overlook Hotel and maze exterior was built there. Elstree Studios: The Colorado Lounge hotel foyer was built on Stage 03. The snowy maze interior was built on Stage 01 at Elstree Studios. The apartment was built on Stage 08 and Stage 09. The playroom and then toilet sets were built in the Elstree Workshops as all of the soundstages were used. Corridors were constructed to link the soundstages up so that continuous shots were possible between stages. A new novel was published in January 2013 entitled 'Doctor Sleep' by Stephen King- it picks up the story of Danny Torrance as a middle-aged man. 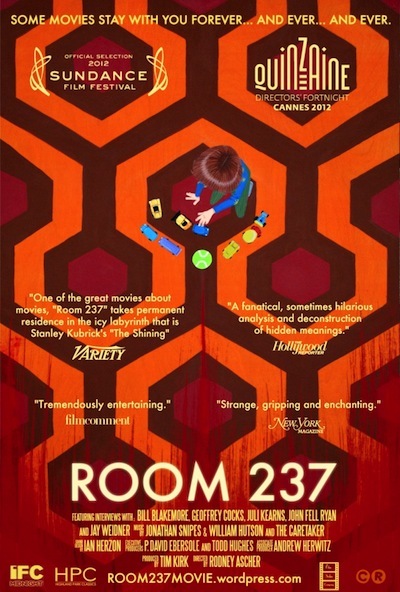 Highly rated documentary following five The Shining obsessives as they explain their analyses of the movie. Empire Magazine (November 2012) say it's "the best movie about a movie we've seen in ages *****"
NY Times article "Cracking the Code in Heeere's Johnny"
The British Film Institute re-released The Shining in UK cinemas - it was the US version, 24 minutes longer from the previously seen European theatrical release. 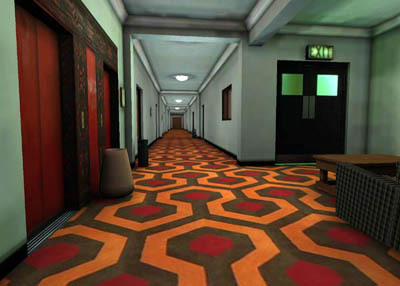 All interior scenes of The Overlook Hotel were filmed on soundstages. The 'Colorado Lounge' set (the hotel foyer) was built on Stage 3 at Elstree Studios. Because of the intense heat generated from the lighting used to recreate window sunlight (the room took 700,000 watts of light per window to make it look like a snowy day outside), the lounge set caught fire. Fortunately all of the scenes had been completed there, so the stage was rebuilt with a higher ceiling, and was eventually used by Steven Spielberg as the snake-filled Well of the Souls tomb in Raiders of the Lost Ark. Stanley Kubrick wanted to shoot the film in script order. This meant having all the relevant sets standing by at all times. In order to achieve this, every soundstage at Elstree was used, with all the sets built, pre-lit and ready to go during the entire shoot at the studios. One of few sequences filmed out of chronological order was the memorable sequence of blood flowing from the elevators. The blood was a movie special-effects product called 'Kensington Gore', and thousands of gallons was used. At the start of the movie, and in a long shot, the hotel featured is the Timberline Lodge, at Mount Hood in Oregon. For the rest of the movie, the outside of the Overlook Hotel and the exterior of the maze was constructed on fields at the rear of Elstree Studios. The Overlook Hotel set (see photo right) was built in forced perspective; it was smaller in reality than it looked on camera. According to Variety magazine, the film took almost 200 days to shoot. However, according to assistant editor Gordon Stainforth, it took much more, nearly a year. The film was originally supposed to take 17 weeks, but it ultimately took 51. Because the film ran so long, Warren Beatty's Reds and Steven Spielberg's Raiders of the Lost Ark were both delayed as they were both waiting to shoot in Elstree Studios. The interior of the maze was constructed on Stage 1 at EMI Elstree Studios (map shown above). It was shot using an extremely long lens (a 9.8mm, which gives a horizontal viewing angle of 90 degrees) which was kept dead level at all times, to make the hedges seem much bigger and more imposing than they were in reality. The groundbreaking camera swooping through the snow-bound maze is courtesy of Garrett Brown and his Steadicam. Introduced in 1976, the device consists of a complex stabilising arm with counterweights which acts with the camera operators' body to cancel out any unwanted camera movements. First used for the steps sequence in Rocky (1976), the shots achieved in The Shining brought the system great acclaim. More about Steadicam. The exterior of the maze (as shown in tracking shots featuring movement between the Overlook and the Maze) was built on the small backlot at EMI Elstree Studio. To fit everything in, the sky backing had to be removed from the water tank on the backlot. It's believed that a wide portion of the maze seen in one sequence featuring Wendy and Danny with visible clouds in the blue sky was built on the former MGM British Studios Borehamwood backlot (which Kubrick was very familiar with, having shot 2001 at that site). Christian Salvesen were using the site as a cold storage depot after the studio was closed in 1970, but there was still a large amount of vacant land at the rear of the site). The Kitchen set was built in a warehouse area adjacent to the Art Department at Elstree Studios, and not in a soundstage. A combination of Styrofoam (long shot) and industrial Dairy Salt (close-ups) were used to make the snow scenes at Elstree match seamlessly with location footage of snow storms shot in Washington State. The snow was dropped from bags mounted on large cranes, and caused many problems with the Borehamwood drainage system after the styrofoam chips blocked up the drains. Some of the snow also blew into neighbouring residential areas. The green mound of earth at the rear of this shot is hiding the housing that is immediately adjacent to the studio site. This pair of videos show that Kubrick intended The Overlook Hotel to be far more illusionary and labyrinthine than we realised. 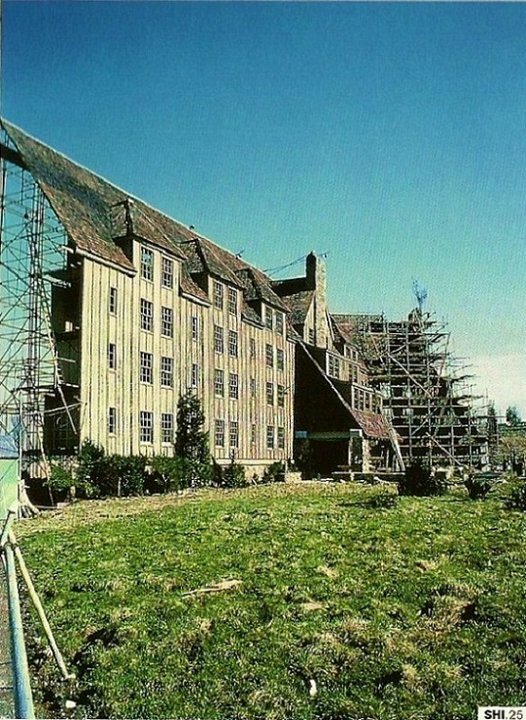 2 - Full scale set of the exterior of The Overlook Hotel, on the backlot at Elstree Studios (source unknown).